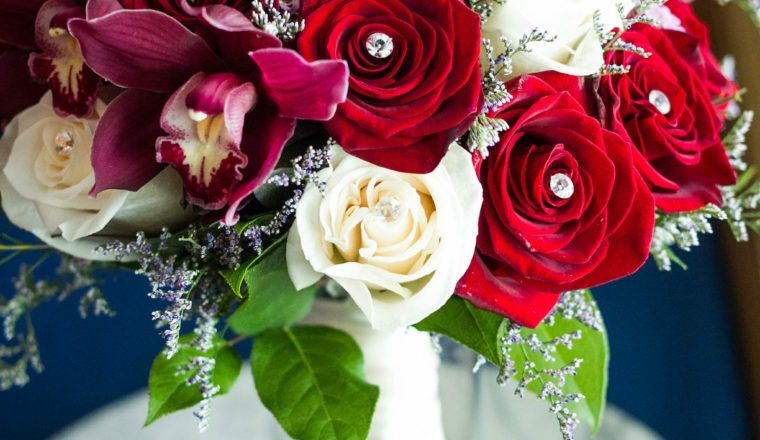 Haley and Pawel’s gorgeous fall wedding featured burgundy and red! From the mens pocket squares, to the bridesmaids dresses and of course the flowers! Haley had such a beautiful bouquet featuring burgundy roses, ivory roses, wax flower, limonium, safari sunset and cymbidium orchids. And you cannot forget the crystal bling in Haley’s bouquet! Pawel’s boutonniere was also a cymbidium orchid. The reception, which was held at DiNolfo’s in Homer Glen, featured a trio of submerged burgundy roses with gold candles! Thank you to Edward Fox for capturing the day!